You are not the first to start Yoga. You will not practice it alone. A Mysore class is where students learn and practice poses from the several Ashtanga series. The postures in the sequences flow together using a special breath-movement technique called "vinyasa." The instructor teaches each sequence, pose by pose, to each student. Students practice up to the posture that is appropriate for their experience and physical capacity, and then they move to finishing or more restive postures. In this way, injury is avoided as the body is given time to adapt. This process requires — and nurtures — patience and steadfastness. As strength, flexibility and stamina improve, more complicated postures and series may be practiced. A Mysore class is a unique Yoga class setting — the room is silent but for the sound of the breath. Students follow their own inhale-exhale and thereby move at their own pace. They can remain in poses longer, or repeat them to address those "interesting" areas. The instructor also tailors unique alignment adjustments as well as physical assistance to each person. In this way, each student is met where they are at each moment. Both experienced and beginning students practice together in the same space. The Mysore style also helps each person develop an independent and intimate personal yoga practice — ultimately, you flow to the rhythm of your very own breath and ability. The Ashtanga method is intended as a daily practice, and traditionally practice takes place every day except for Saturdays and new or full moon days. Why Is It Called "Mysore?" This style — that of a personal yoga practice, yet one supported amongst a like-minded gathering — originated in the south Indian city of Mysore. This method of teaching flourished under the auspices of Sri K. Pattabhi Jois, who helped pioneer and maintain it. Jois, seated right, taught this system for more than 60 years. 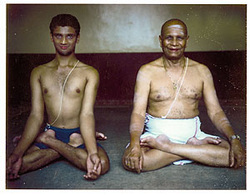 He passed in 2009, and his grandson Sharath, seated left, currently directs the Jois Ashtanga Yoga Institute in Mysore, India. Is It Called Mysore Because It Makes You Sore? Calling yoga "Mysore" is some kind of cruel joke, isn't it? But no, it's not called Mysore because it makes you sore. Although you may experience some soreness. Hands-on adjustments are often given to insure accurate alignment and form. They are also given to take a student deeper in poses. Please let your instructor know if you do not wish to receive any adjustments. If you need help with a particular asana, don't hesitate to ask for help, or get the instructor's attention. I'm A Beginner — Is Mysore For Me? If you're new to yoga, a Mysore class is perhaps the best way to learn Ashtanga Vinyasa. You can be taught individually, pose by pose, in order to establish a firm foundation. The Ashtanga sequences can be scaled up or down specifically to meet your unique needs. You'll brush up against your limits, and yet won't crash over them. New students are welcome to watch class before joining. If you have little to no previous yoga experience and wish to participate, we require a New Student Pass, which asks for a commitment of three classes in one month. We will begin with Surya Namaskara A, and then add Surya Namaskar B. Initially your practice will be less than 30 minutes, but in time we'll add poses, and your practice will lengthen as we introduce the standing poses and new asanas as appropriate. Postures are given, one by one, in a prescribed, sequential order. If you have trouble with a particular posture, the teacher can offer you a modification that is consistent with the intention of the practice. To learn the poses "one by one" also means that once you are given a new posture, you practice the sequence through until you get to that posture, then wind down your practice with backbends (if appropriate) and the finishing sequence. The teacher will give you the next posture in the sequence when it is appropriate. I'm A Beginner — How Do I Get Started? If you have little or no experience with the Ashtanga system, please enroll in one of the monthly Intro to Mysore Intensives. This is a 3-week-long course that is the first two weeks of your membership at Portland Ashtanga Yoga. It features 9 classes total. These classes are held on Mondays-Wednesdays-Fridays from 6:30-7:40 a.m. Class size is capped at just 5 people. You may check the dates of the current intensive here. As stated above, all levels practice side-by-side in a Mysore class. Do I Have to Remember All the Poses? You will practice the sequence of poses that you can remember, no more and no less, and then, when you lose the thread, you'll move to a finishing sequence. This is when either you are exhausted and spent, or you no longer remember the next pose. Given consistent effort, you will very quickly learn the sequence. Can I Use A Cheat Sheet? Learning the correct sequence of poses is to participate in the Ashtanga Vinyasa tradition. It's also a profound way to take charge of your own yoga practice. You're more than welcome to study print-outs of the sequence (a.k.a. "cheat sheets") at home. However, in class they tend to become a distraction, and can lead to an over-intellectualization of the practice. Worse, they reduce this wonderful practice to a mere laundry list of poses to complete. Just know that hundreds of thousands of people have learned Ashtanga Vinyasa. You can learn it, too, and sooner than you think. So have faith and enthusiasm. In a Mysore class, you can draw strength, support and comfort from the community of people practicing around you. Know that everyone — including the instructor — has learned the sequence, addressed uncertainty, and faced not knowing, just as you might be. The practice room is open between 6:00 and 9:00 a.m. Monday–Friday (8-10:00 a.m. Sunday). The Ashtanga method is intended to be a daily practice, and students are encouraged to make a commitment to practice at least three times a week for a month at a time. Traditionally, we practice every day except for Saturdays and moon days. It may be very difficult at first to commit to a daily practice, and it often takes time to establish this. Regular attendance is encouraged, although a few times a week combined with a self-practice at home is sufficient. Drop-ins are fine for out-of-town visitors or others with an established practice. Doors open at 6 a.m. You can arrive at any point until class ends at 9 a.m. If the door is locked, stand on the sidewalk and press the button until I come out to let you in. I'd prefer everyone start by 8, but if you have to choose between arriving at 8:30 or no practice, show up at 8:30. Do I Have to Get Up That Early? Listen buttercup, it's time to rip off the band-aid. To develop a Mysore practice is to deepen, broaden and evolve your own yoga practice. You'll also support and be supported by a community of like-minded people. Some morning Mysore practices are like stepping into a jet-stream — you are borne along on a vital circuit of energy that is greater than you, more mundane than you, and nothing but you, all at once. When you are finished, you will lie down and take rest. You will rise from your rest like Lazarus to find the world profoundly changed, and yet exactly the same. For that to happen, you have to get up in the morning. You are not a "night person." "I don't do mornings" or "I'm not a morning person" are excuses. Despite what your mom told you, you are not a unique snowflake — you are a diurnal mammal, which means you function best during sunlight. Put your alarm clock across the room. When it rings, get up. What If I'm Not Flexible in the Morning? To paraphrase a quote I once saw at Vancouver Ashtanga, you're never too dirty to take a shower. If you wait until you're flexible enough in order to take a yoga class, you will wait until death. On a purely physical level, consistent morning stretching eventually allows you to perform movements that require considerable flexibility with little or no warm-up. Do I Have to Go to Work All Sweaty? Yoyoyogi features 2 luxurious showers. You must provide your own towel. Wear loose, comfortable clothing in which you can sweat. Socks (and mittens) will not work. You are not obligated to wear spandex, Speedos, or Lululemon's latest. As a rough rule of thumb, try not to eat or drink anything 2 hours before practicing. Over time, you'll figure out what and how to best serve your unique nutrition needs. Please wear clean clothes. Please shower before class. Deodorants and scented oils are okay, just don't bathe in them. If you have to ask if you're wearing too much, then you're wearing too much.